This winter in France is a real one, one of the coldest we had since many years! Last week, snow storms were all around France, including Disneyland Paris. Yesterday, as the weather was better and the sky perfectly blue, i went to DLP to took pictures of the park under snow. Even if it doesn't show on the pictures, they were a lot of people at the park this week-end - almost like a regular sunday - and the snow had melted on the walkways but not everywhere else as you will see below in one of the biggest update ever done on Disney and more. There is more than 90 pictures and all are in high-res as usual, so i think you should enjoy this "winter" update! Let's begin by Fantasia Gardens! Next, Town Square on Main Street USA! Let's move to Frontierland where a big surprise awaits us! Everything around the Fort and the Indian village is covered by snow. But the big surprise is when you arrive near the Rivers of the Far West: the whole river is totally frozen, icebergs everywhere! Because of the ice the Mark Twain and the Molly Brown are not working. However, this ice is a haven for the seagulls who can "land" on it! Let's have a look at Phantom Manor's area and Boot Hill! The geysers are totally covered by snow! O-kay, let's move now to Adventureland, beginning by the entrance: no more sand in the oasis, only snow! Next, Colonel Hathi's restaurant and Indiana Jones. Hakuna Matata and Swiss Robinson Tree area. Let's have a look now to Adventure Isle. Guess what? 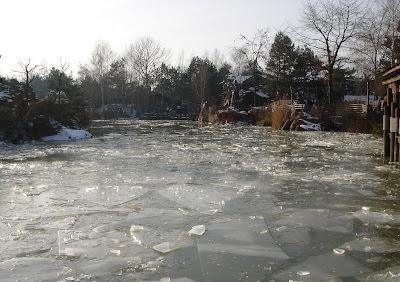 Yes, Adventureland Lagoon is also totally frozen! And when i say frozen, i mean REALLY frozen! Goodbye Adventureland, Hello Fantasyland...where the ponds are also frozen! Fantasia Gelati is more "gelati" than ever! If you've never drive on Autopia with snow all around, it's now or never! On the side of Space Mountain which is in the shadow, the snow is still there! Okay, that should do it for today, and i hope you've appreciate this big winter-at-DLP report. Feel free to use any of these pictures as wallpaper for your computer if you wish, and any kind comments will be highly appreciated! DLP looks wonderful in the snow,especially the frozen water round BTM. Made me laugh when I saw the trees with snow round them,when you think the last few years for the Christmas season we have always had fake snow. Incredible pictures. To see a Disneyland under snow is unreal. Never happens in California! Thanks Alain. Very much appreciated. Goregous piccies! Thanx so much for sharing them with the rest of us! That's gorgeous! When I was there 2 weeks ago, it was COLD, but no snow. The water areas around the castle were just starting to freeze, though. From someone who lives in a cold and snowy climate, these pictures are terrific. Any idea how Disney handles snow removal? Here in Wisconsin we prefer snow blowers, plows, shovels and tons and tons of salt. Hello Justin, No, i don't know how DLP is doing to remove the snow out of the walkways, but they're probably very well equipped as it is essential for the park to avoid anybody slipping because of the snow. You continue to have the best Disney info site of all, and get better all the time. Incredible pics! Thanx. Great pictures! It's amazing just how much some snow and ice changes the whole atmosphere of the park.